Motor Trend has already tested the new Focus ST against the MazdaSpeed3… and the ST won. But car buying is more than just numbers or styling – the unanswered question until you buy and begin to live with it is what the car would be like in ownership. Day-to-day driving, bad traffic, the occasional blasts down back country roads, cruising down the highway or even squirting the car from stoplight to stoplight. That’s the part that magazines almost never cover. If you decide you can live with the styling of the Mazda3 family, you can certainly live with the engine and transmission. 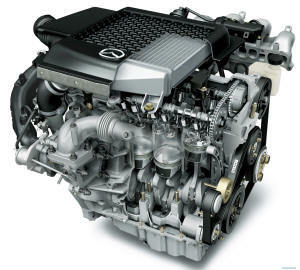 The engine is a nearly state-of-the-art turbocharged and direct injected 2.3 liter engine. You might literally say that the MazdaSpeed 2.3 was an EcoBoost engine before there was a Ford EcoBoost family. Not only is the engine a Ford engine design underneath, Ford owned the majority of Mazda when the engine was originally developed. But the biggest problem is torque steer, wildly absurd torque steer. In a chassis that was obviously never designed for this engine. Can you live with it… and if you choose the next-gen version of this same chassis – the Focus ST, can you live with the diminished torque steer that is still present in that car (and to one large degree or another, all front wheel drive cars?). Motor Trend set out to compare the two. Yes, the older design looses again, and badly. We know that a new Mazda3 is coming very soon, spy pictures have shown a similarly sized vehicle being tested and we also know that the chassis is all-new. What we don’t know is if a MazdaSpeed engine will even be offered, and what we won’t be able to find out until that question is answered and a MazdaSpeed3 is delivered is if Mazda will tame some of it’s likely torque steer. And, just in case Mazda decides not to offer such an engine again, here’s a link to our high-res image of the MazdaSpeed3 engine. Click on the image!